And the reason I know is that I have been through this experience myself with my children so I know first hand how you feel. But I want you to remember: Divorce is a process not an event and divorce needn’t be like this. I’ve worked with many parents going through divorce and one of the main worries is how to tell the children about what is going to happen and what to actually say to them and how to nurture them through the very painful, and often traumatic, process without damaging their self esteem and self confidence irreparably. Children naturally fear that they’ll lose one of their parents in divorce or that their parents will abandon them. They also fear the changes and disruptions that divorce inevitably brings to their family. Also lots of children often blame themselves for the break up. When a marriage becomes troubled, a couple often relies on old habits of interacting, which lead to fights rather than solutions. If those old habits didn’t lead to constructive solutions during the marriage, they’ll surely reap no better results during the divorce. Bitter fights in the divorce courts often stem from these old ways of handling differences and while you may not have been a united front while married, you and your partner must take this opportunity for the good of your children to work together to find ways to nurture them through this time of change. The One Page Profile Process will dramatically lessen your feelings of anxiety, worry, guilt and overwhelm. You will definitely now have a practical, simple & easy way forward. I will help you to create a powerful One Page Profile specifically designed to support your children through this traumatic time in their lives positively so you can all feel more relaxed and positive and free yourself from some of the guilt, anger and resentment you inevitably feel about what’s happened. It’s never easy when a marriage or significant relationship ends, whatever the reason for the split, and whether you wanted it or not, the breakup of a relationship can turn your whole world upside down and trigger all sorts of painful and unsettling feelings for your whole family. A bad marriage can make parenting and life in general incredibly stressful and you probably have said and done things you regret, looking back in hindsight. But it’s not about pointing the finger of blame towards anyone, particularly yourself, or about driving forward constantly looking in the rear view mirror. It’s now about creating a positive, hopeful, stable and secure future for yourself and for your children. The loss of the family structure can be incredibly upsetting and distressing for everyone involved as divorce is a major change but there are plenty of things you can do to get through this difficult time and to move forward. 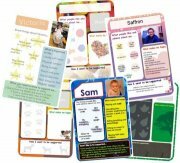 Learning how to create a One Page Profile will transform your child’s confidence, give you some tangible and practical ways to help them through the transition and give you some simple, loving ways to nurture their self esteem so their self confidence is not damaged permanently by the experience. The One Page profile Process will deepen your relationships, strengthen your bonds and give you all a sense of unity quickly and easily. 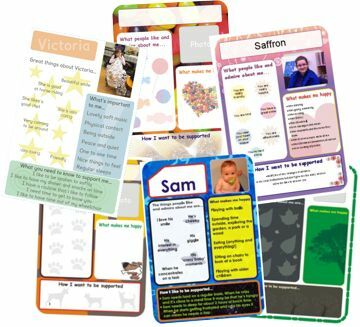 Doing a really simple One Page Profile together with your child, on your own or with your partner, will bring you confidence, & clarity and will help you RELAX knowing you have paid attention to detail and that they will experience love and support in the way that they like to receive it. Lots of parents pop the One Page Profile page up in the kitchen and add personal photos and pictures to make it look unique & special and what’s so wonderful is that it keeps growing and changing as your child grows and changes too and things settle down. 1. An appreciation about your child – what they like about themselves and what other family members love, respect and admire about them. 2. What makes your child REALLY happy and is most important to them from their perspective. 3. How to support them at home, at school and in life generally while they are going through these changes in their family circumstances. The One Page Profile is a simple, profound & powerful technique to have in your parenting toolkit – so join me for a couple of hours while we work together to nurture and transform your child’s life. If you would like to go learn how to do a One Page Profile or come on a One Page Profile Family Workshop click here – or contact me on 01342 833355 today to arrange a time that fits in with your busy schedule. Sue Atkins is the founder of Positive Parents. She knows what it is like to be a parent. She is on that roller coaster ride of negotiating, disciplining and communicating with her own teenage children, every day. Sue knows how tough being a parent can be.